Nine decades of HSU history – as recorded by student journalists for the Lumberjack newspaper – will be scanned and made searchable online. 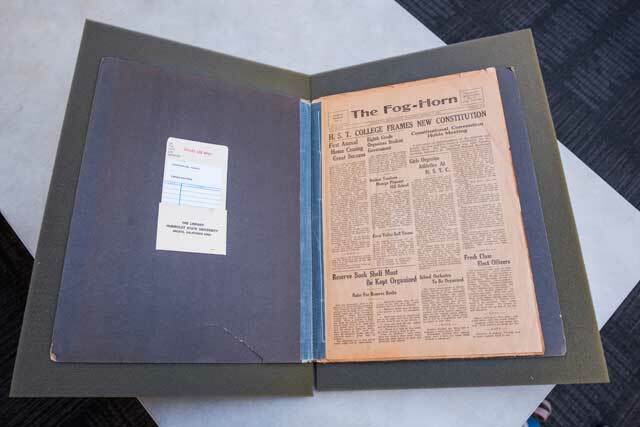 The first issue of The Fog-Horn — which would later become the Lumberjack — was published in 1929. Under the HSU Library project, students will be hired to scan newspapers from 1929 to 2019 — from microfilm, paper editions, and more recent PDFs of the paper. The archives will be available on HSU’s Digital Commons. Librarian Garrett Purchio, an HSU journalism alum, will be training the students to use scanning software and database systems. The newsroom of the Lumberjack. 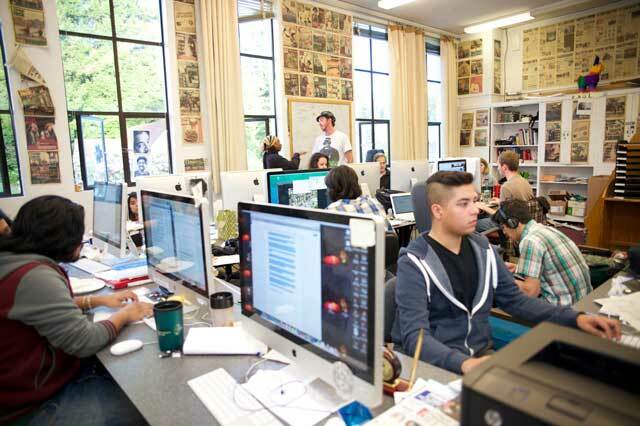 The Humboldt State University student newspaper turns 90 this year. Purchio worked for the Lumberjack for 11 years — first as a student, then as an alum. He was a student sports reporter, sports editor, and layout editor. From 2009-2017, Purchio was business and advertising manager for the Lumberjack and other HSU student media. Through student reporting and writing, the Lumberjack, which is celebrating its 90th anniversary in the fall, has provided a running chronicle of Humboldt State and the Arcata community since its first edition came out in 1929. Journalism Professor Marcy Burstiner, who has advised the student newspaper since 2004, applauded the digitization project. The Lumberjack has been a training ground for hundreds of journalists who now work around the world at global media venues including Forbes, the San Francisco Chronicle, HuffPost, and Al Jazeera English, and who work in public relations from Los Angeles to Tokyo. Lumberjack editor-in-chief Dajonea Robinson says she’ll enjoy having the archives available for the use of her reporters and section editors. 1 Harpst St., Building 88, Arcata, CA 95521 - Contact Us.